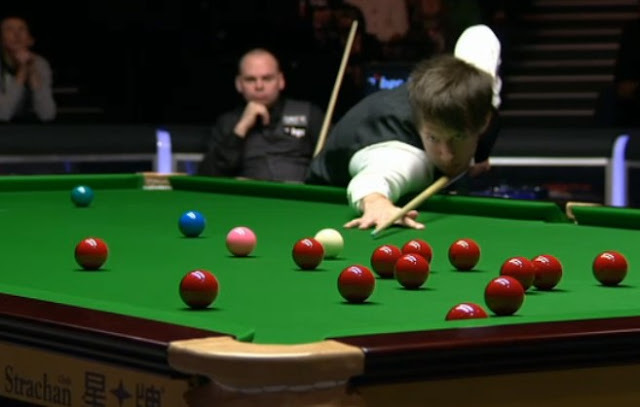 The UK Champion was out of the traps like a greyhound and quickly wrapped up the first frame with a break of 87. The Bristolian had the first opportunity in the second framed but missed a blue off it's spot to the corner. To make matters worse he left Stuart with a easy red to the corner and Bingham made no mistake in compiling a decisive 69 to level at 1-1. The pattern repeated itself in frame three as Trump on 45 ran out of position and had to play safe. He was soon back at the table, only to miss a simple black. 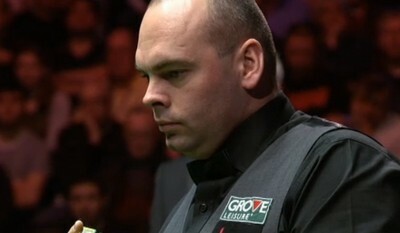 It was to cost him the frame as Bingham cleared up to lead 2-1. Three frames played and Judd, who could have been 3-0 up was 2-1 down, against an opponant who was taking full advantage of any mistakes. If Judd was worried it certainly didn't show as Judd calmly compiled a 107 to level at 2-2 at the mid session interval and leave the match in an intriguing posititon. But on the resumption it was Stuart who confidently stroked in a 73 to move 3-2 in front. With bits and pieces Trump drew level and then produced a 121 clearance to lead for the first time since the opening frame. The eighth frame was not so clear cut as it remained in the balance up to the colours as both players failed to capitalise on the chances that they had. With the scores poised at 52-49 in favour of Trump it was Judd who with a shot to nothing on yellow finally clinched the frame with a 25. There was more drama to come after that as Trump looked as though he had done the hard work with a break of 50, but a miss on a long red to the corner combined with failing to pot a red over the corner pocket left Stuart with a chance to get back into the frame. As Stuart worked his way through the remaining reds and the yellow the score were showing 50-50. In these circumstances you can't phone a friend or ask the audience what to do. All you can do is decide for yourself. A failure on the green led to a safety battle on the remaining colours and it was Bingham who made the fatal mistake of choosing valour over discretion. A missed green left it in a pottable position to the corner. As Trump cut the green in the match was decided and brown, blue and pink soon followed together with a handshake from Stuart.